Please direct comments or questions to Hannah Barrett, Research Coordinator, via email hbarrett@clcmn.edu. AgXplore implemented a field scale trial here at the CLC Ag Center. This project researched the effect of Agxplore’s product N-Zone max applied to nitrogen fertilizer applications, and its effect on maintaining nitrogen in our leachable, sandy soils. The typical nitrogen application of 180 units of nitrogen was used as a control. Control was then compared to two treatments one with +50 units of N and one with -50 units of N. Each of these aforementioned treatments were then separated into two groups. One group had nitrogen that received N-Zone max and the other group did not. This made a total of six different treatments. Each treatment was replicated four times. The plot size was 25 acres. The yield was the main determining factor on analyzing statistical differences. North Dakota State University’s dry bean breeder Dr. Juan Osorno conducted a dry edible bean plot. The purpose of this five acre plot was for variety selection relating to the NDSU breeding program. Research is done on kidneys, pintos, blacks, navies, as well as many others. Research focusing on the product polyhalite was conducted to investigate the effects of polyhalite on corn yield. Demonstration projects were also implemented to compare corn varieties and populations as well as in-furrow treatments. This project is in collaboration with the Minnesota Department of Agriculture as well as the University of Minnesota. The goal of this study is to verify the best management practices for nitrogen fertilizer rates and application on sandy soils in dryland and irrigated plots. Elite Corn Trial – The UMN Agronomy and Soil Science Department establishes an elite corn trial replicated throughout the state of Minnesota every year with a long-standing history to test new corn varieties. Hazelnuts – Lois Braun, University of Minnesota hazelnut researcher, established hazelnuts at the Ag Center in 2000. This project’s goals have evolved throughout the years and is currently being evaluated for winter hardiness and hazelnut nitrogen requirements. Fertilizer trials – Dr. Daniel Kaiser, part of the UMN Department of Soil, Water, and Climate, is the primary researcher leading these studies. His studies evaluate the different effects of fertilizer rates upon corn and soybeans. The primary nutrients that are being studied are the plant macronutrients phosphorous, potassium, and sulfur. Kernza – Dr. Craig Scheaffer has initiated a research project here at the Ag Center concerning a perennial grain crop, kernza. The goal is to reduce the carbon foot print of food production of cereal grains. Potatoes – Collaborations between the UMN Soil, Water, and Climate Department as well as RDO were instrumented in this research project. This project researched the effect of different potato seeding populations on potato size, density, growth, and yield for seed potato production, while also evaluating nitrogen flow through lysimeter samples. This project collaborates with the USDA based out of Fargo, ND. 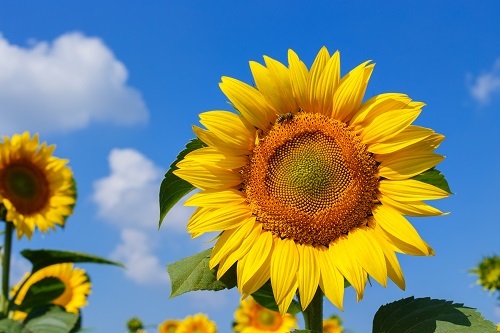 The research on sunflowers primarily focuses on finding plant resistance in sunflowers to schlerotinia commonly known as white mold. This research has been implemented for the past eight years. The fields at the CLC Ag Center have the soil type and irrigation necessary to have disease development. Through talking with farmers and researchers in the region, a need to research the effects of in-furrow treatments on edible beans was determined. A starter fertilizer Aventine Complete and a fungicide Headline were applied in-furrow separately and in combination to determine effects on yield. The second variable that was considered in this experiment was varying nitrogen top dress applications of 0, 30, and 60 units. The first year’s results have been analyzed. This project will be carried out again in the 2018 growing season. Both ADM and Provita are interested in improving dry edible bean production. These companies send developmental seed lines throughout the dry bean production region of the United States to be tested for yield and agronomic characteristics. The Ag Center had a breeding selection plot for both ADM and Provita this season to look at yield, maturity date, and overall appearance of the beans. ADM had a total of 90 two row plots, and Provita had a total number of 296 four row plots for the 2017 growing season. Further questions or comments? Please direct them to Hannah Barrett, Research Coordinator, via email hbarrett@clcmn.edu.